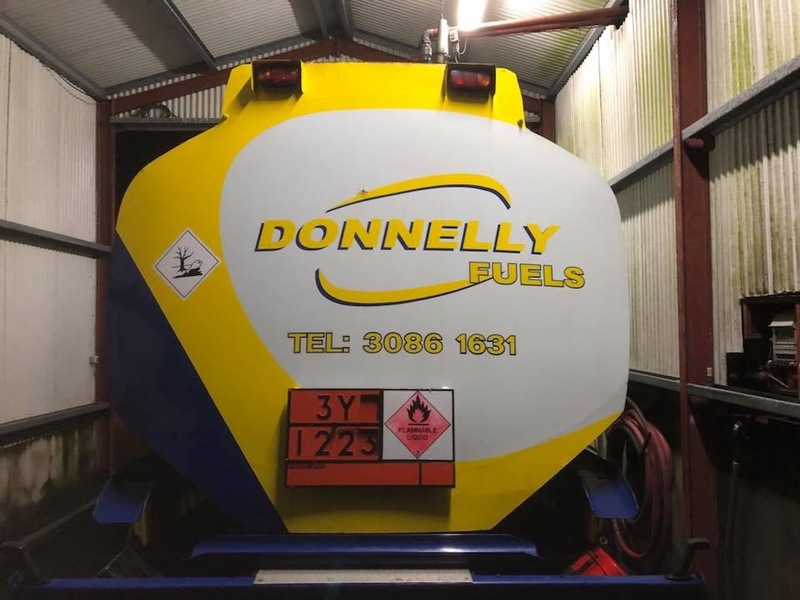 This week’s online notes have been sponsored by Donnelly Fuels, Concession Rd, Crossmaglen . 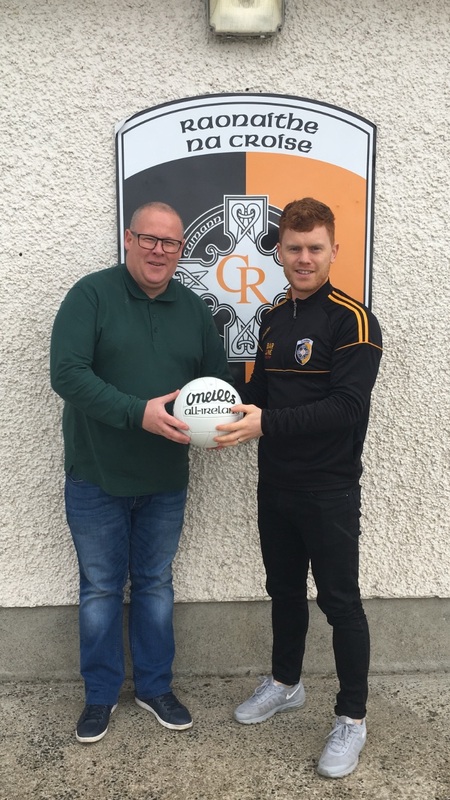 Thanks very much to Kieran, Johanne and the Donnelly family for your sponsorship and ongoing support for the club. If you would like to sponsor the online notes, please email [email protected] or telephone, 0876659126. 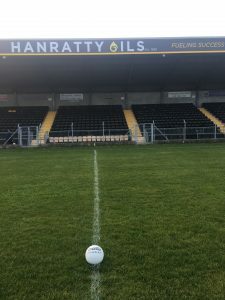 The second game on Sunday in St Oliver Plunkett park saw our seniors against Harps. Mel Boyce slotted over a point to get the scoring underway, Harps levelled it a minute later. Harps got the opening score of the second half to extend their lead but we responded, four points without reply, Aaron Kernan (1,F) and Mel Boyce (3,2F) to leave only the bare minimum between the sides. Harps converted a free to stretch the lead to two once more. As the minutes ticked down to full time, both teams scored two points, Aaron Kernan (2, 1F). We had a number of missed opportunities, Chris Crawley scored a point as full time approached to bring it back to a one point game once again. Harps scored a point in injury time to help to seal the victory. Armagh Harps V Cross @6.45pm, Abbey Park. Cross V An Port Mór, Cross @2pm, Cross. 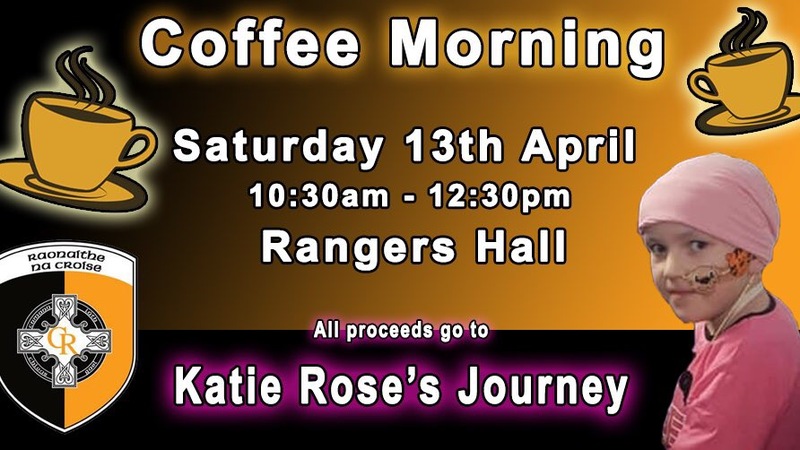 We are delighted to have so much support for our event, from the local businesses and the community. This is the second year of this great event. The Ladies club invite would you all to come along and help us complete 100 laps of Cross Square. This is a family fun event for all walkers and runners a like, and we encourage you to complete your laps at your own pace. On the day you just sign up outside the hotel and make a donation. It’s that time of year, when old registrations must be renewed and new players have to be registered. 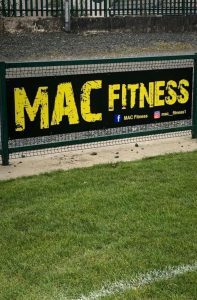 Unfortunately, the Ladies football registration is separate to the main club registration and the camogie registration. Therefore, in order players to be play they must pay both registrations. The cost of registration remains the same, £20 for all players who are under 18 and £30 for all players over 18. Managers will have forms and be collecting money this week. Training continues for all age groups this week and the league is about to start for everyone. 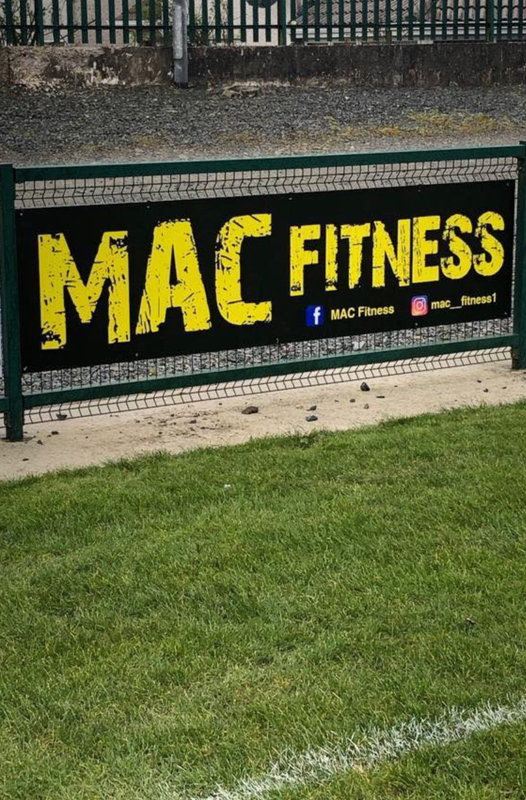 Training continues on Monday evenings from 6-7pm on the council field. Massive well done to the grils who drew with Carrickcruppen last week, and took on Cullyhanna yesterday in their opening league matches. Just a reminder to parents, that it is essential that all players have been registered, have their gum shield and football boots with them. Jerseys will be provided for the game. 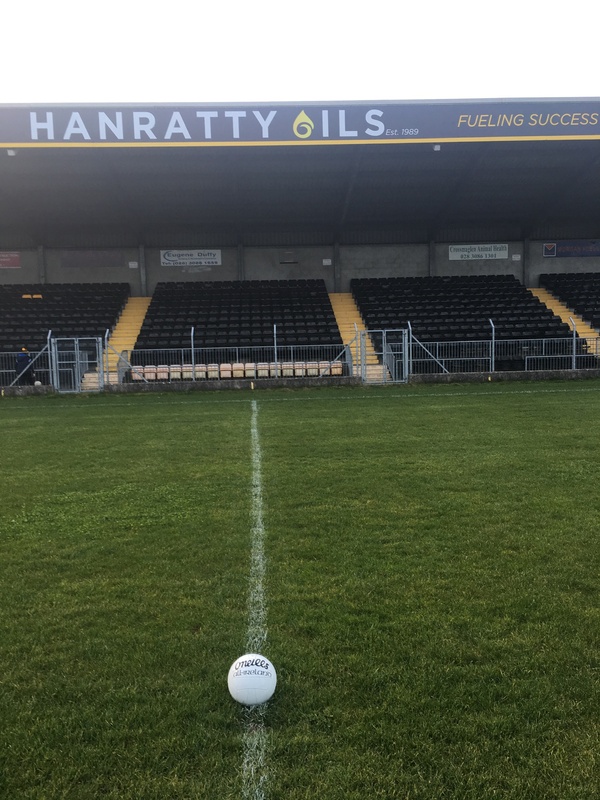 The U16s play Ballyhegan in the League on Monday evening at 6.45pm at home, while the U14s take on Shane O’Neill’s, game details will be confirmed later in the week. Meanwhile, training continues on Saturday at 4pm with Shannon, Frank and Paul. There are some players who have not come back from last season, and it’s not too late, everyone is welcome to join at any stage. Maria and Peter will be in touch about training and registration payment. The seniors have had a positive start to the league, with a win against Mullabrack and Mullaghbawn. Anyone who has ordered goods, I will post when items have arrived to Short’s. We will have an evening in the hall where you can collect the gear ordered and there will also be an opportunity to purchase items. Debit and credit card facilities will be available and a deposit will secure any item. Karen’s Kool embroidery will also be in attendance if anyone wants to get their club gear personalised. 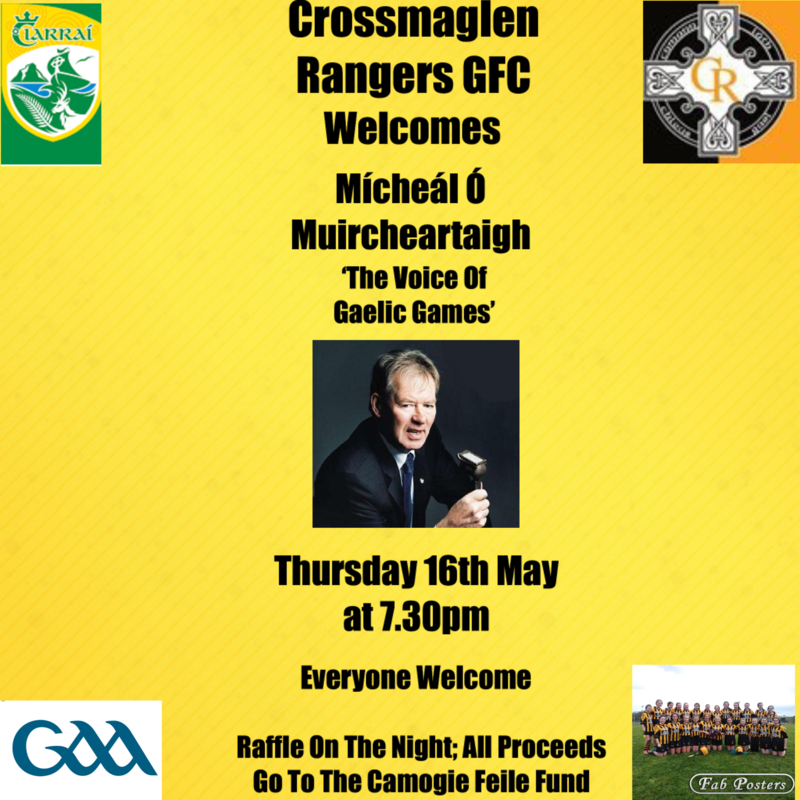 We are delighted and honoured to announce that on Thursday, 16th May we will have a very special guest visiting the Rangers Hall, the one and only Micéal Ó Muircheartaigh, the voice of Gaelic games. Mícheál will speak about his amazing journey through life, the people he has met, the problems he has encountered and overcome and despite being aged 88, his calendar is always full. There will also be an opportunity for questions and answers. First prize; Signed Ireland Jersey. Many thanks to Joe Kernan fur donating the jersey. Second Prize; A Kerry Jersey signed by Mícheál. Third Prize; A signed copy of Mícheál’s book. 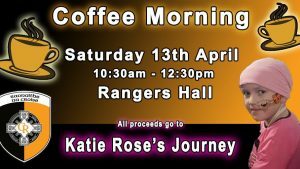 All proceeds from the raffle will go to the Camogie Feile All Ireland Fund. The evening kicks off at 7.30pm, admittance is free, tea will be served and everyone from near and far are very welcome to attend. 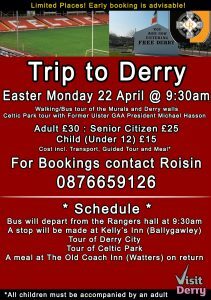 Few seats left for our upcoming trip to Derry. A tour guide from Visit Derry will accompany us on the tour which will be both a walking & bus tour of the Murals and Derry’s historic walls. Michael Hasson, former President Ulster GAA will welcome us to Celtic Park and he will take us on a tour of the grounds. On our return to Castleblayney we will have dinner in the Old Coach Inn. Adult £30, Senior Citizen £25 and child £15. (U12).To book, PM Cross Rangers or telephone 0876659126. Children must be accompanied by an adult. 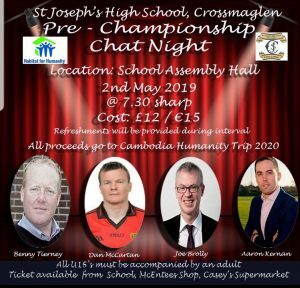 St Joseph’s will host a pre-championship chat night on Thursday 2nd May in the school assembly hall. 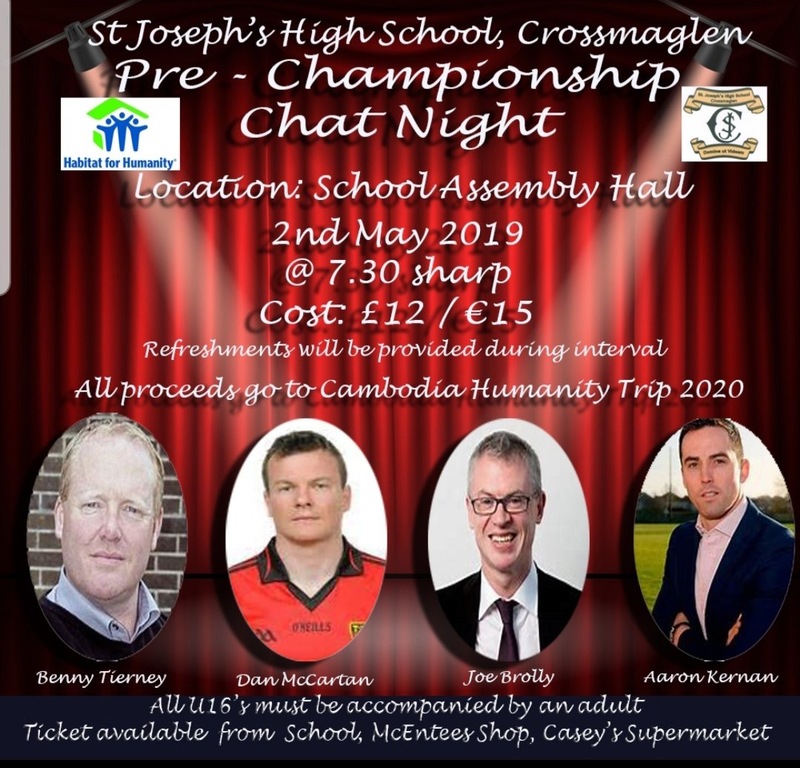 The panel on the night will be four top GAA men, Benny Tierney, Dan McCartan, Joe Brolly and our very own, Aaron Kernan. All proceeds go to Cambodia Humanity Trip 2020. 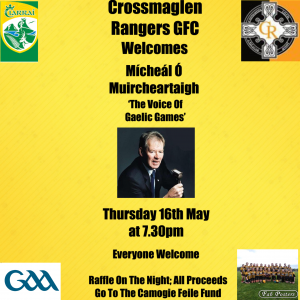 Tickets cost £12/€15 and are available from the school, McEntees Shop and Caseys supermarket. 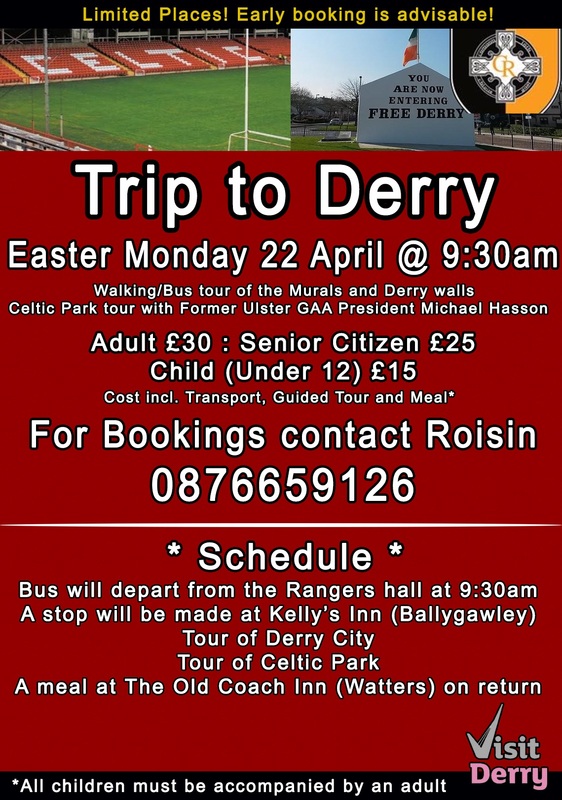 A reminder to everyone who have appointments, the Big Bus will now visit the Rangers Hall on Friday 24th May. Please note the new date. I believe there is no appointments left but they can be contacted directly if you wish to enquire about cancellations of if there is a drop in service. 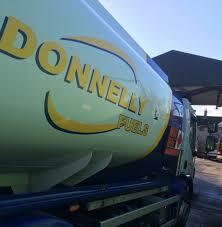 Telephone 028 9080 3344, Option 1. Thanks to everyone who assisted in anyway on Saturday when we hosted the Feile finals. Well done to Pearse Larkin who sang Amhrán na bhFiann. We are erecting new advertising signs. If you would like to advertise your business, a sign costs £350 for three years. This is an ideal opportunity to promote your business and support the club. Thank you to all the businesses who have purchased advertising signs, they are all looking fantastic. Please contact our chairman, Eugene Hanratty or Joe Kernan for more details. 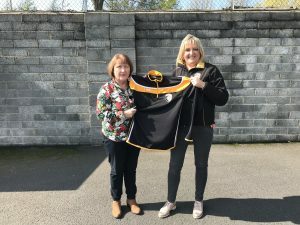 Róisín presents online competition winner, Bernie Fox with one of our new squad tops. Health to wear Bernie! Can you spare a couple of hours on a Sunday evening? 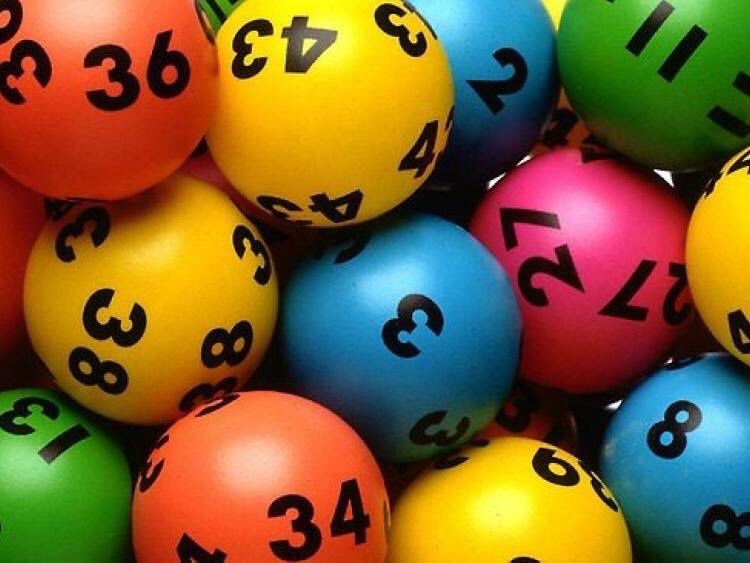 Our lotto committee need extra help in the Rangers Hall, Sunday evenings from 8.30-10.30pm. If you can help please contact any committee member or telephone 0876659126. 5 Matched 3 numbers; Michael McEntegart, Maria Branniff, Mickey McCoy, Margarita O’Neill & Jimmy Quinn win £20 each. 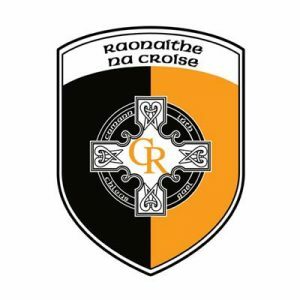 Crossmaglen Rangers GFC send our deepest condolences to Mrs Johanne Donnelly & family on the recent sad passing of her Uncle, Mickey. We would greatly appreciate if club members could share information with members who may not have social media accounts.